For most people, Mardi Gras is the first thing they think of when discussing Louisiana. The crazy parades, great music, tasty king cakes, colorful beads, outrageous costumes, and the amazing parties are a few highlights of this holiday. Lafayette is known to host many parades, events, parties, and great activities including the Greater Southwest Louisiana Mardi Gras Pageant and Ball. Vermillionville is having their Courir de Mardi Gras & Manger celebration on Sunday, February 24th. This day is filled with lots of Mardi Gras activities, history, performances, demonstrations, food, crafts, and music. You can learn a few Mardi Gras songs in French at the Maison Boucvalt. There will be a king cake demonstration and tasting at the Cooking School. Educational Mardi Gras films will be shown at the Schoolhouse. The Pavilion will have a cracklin demonstration and tasting. A few of the art exhibits will include pottery, woodworking, mixed media, glasswork, jewelry, basketry, quilting, and much more. In the Maison Broussard Kitchen, you’ll find a demonstration on open hearth cooking. In Opelousas, Lil Nate’s Annual L’Argent Chicken Run, Rodeo & Parade is scheduled for March 2nd through the 5th. The weekend will have parades, a chicken run, and zydeco headliners including Lil Nate, Chris Ardoin, Brian Jack, and Leon Chavis. The Blue Moon Saloon will be hosting a couple of events for the Mardi Gras celebration. The evening of March 3rd, Valerie Sassyfras is ready to entertain you with her offbeat, zany songs and great choregraphy. Hunter deBlanc will finish the Sunday night with his lovely voice and beautiful piano playing. Monday, March 4th, the Saloon will have Lafayette’s own, Radio Zydeco, whose delightfully eclectic sound will have you dancing in no time. And Mardi Gras day, March 5th, A.J. & the Badcats are going to play their Louisiana blues with a zydeco swing. For those of you looking for the wildest run of Lafayette, I recommend the Lundi Gras Bar-A-Thon. Upon signing up, you get free adult drinks at every stop, prizes for the best costumes, food at the end of the run, a Lundi Gras Party Cup, and guaranteed fun! The 4.8 mile run includes stops like: Freetown Boom Boom Room, Bulldog, Blue Moon Saloon, Rhum Room, and much more. Friday, March 1st is the kickoff for the Mardi Gras weekend. The annual Mardi Gras brochure is a great guide for Le Festival du Mardi Gras à Lafayette that includes live music, games, rides, and of course great spots for parade viewing. The first parade is at 6:30 that evening. March 2nd has two parades lined up: 2PM is the Children’s Mardi Gras Parade and 6PM is the Krewe of Bonaparte Parade. 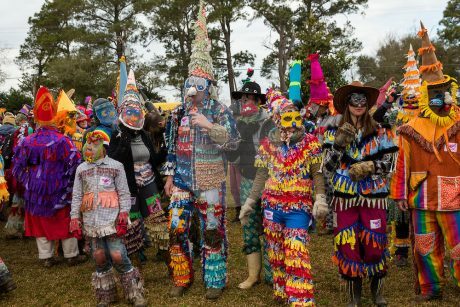 March 3rd is the perfect day for experiencing the rural flavor of Mardi Gras by attending activities in the small, nearby communities. Two parades are scheduled for March 4th: Queen’s Parade at 6PM and the Krewe of Triton Parade at 8PM. 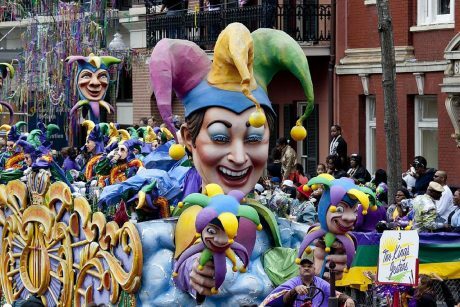 Fat Tuesday, March 5th, has three parades: King’s Parade at 10AM, Lafayette, LA Mardi Gras Association Parade at 1PM, and finally, Fox 15 Independent Parade is at 2PM. Tuesday night there’s the Greater Southwest Louisiana Mardi Gras Association Pageant and Ball at the Heymann Performing Arts Center. We hope you are able to attend some of these wonderful events. If you are visiting the area for Mardi Gras 2019, please book your stay a Louisiana Cajun Mansion Bed and Breakfast. We are perfectly centrally located near all Acadiana Mardi Gras festivities.